Happy Monday! 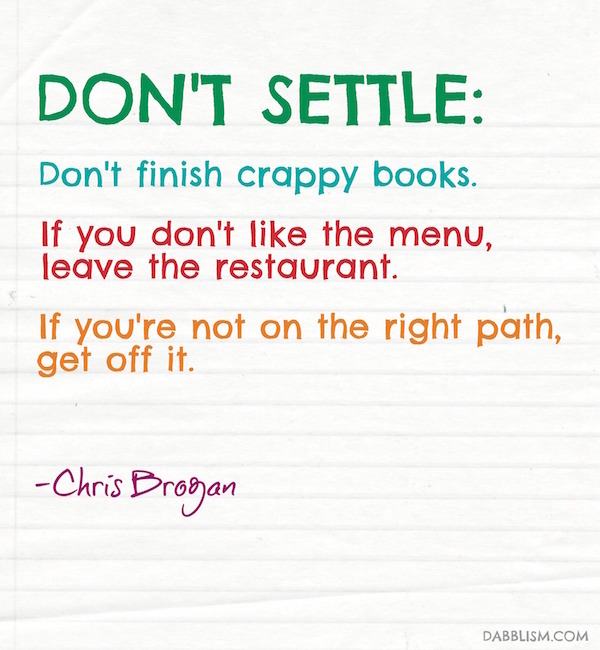 Chris Brogan really nails this quote in regards to being intentional and not settling for mediocre. So many times we live a life that we don’t love and we just learn to deal with it. We tell ourselves that it “could” get better, but deep down we know that it won’t. It’s time to move on. Get rid of that crappy book, leave the restaurant if you don’t want to wait 40 minutes for a seat… let go and don’t look back. As dabblers, we tend to hang onto things that we have not finished. Don’t do it. If you truly did not like that project, book, or movie, get rid of it. Make room in your life (and your shelves) for new things. Why keep that mediocre book on the shelf, when you can replace it with inspiring words. Be intentional about the choices you make. Don’t settle for mediocre.